LonesomeYogurt wrote: Secular Buddhists absolutely do not have the real, original teachings of the Buddha! I have no quarrel with them, honestly, but those who reject rebirth are in fact rejecting a teaching of the Buddha that cannot be cast into historical invalidity without inviting scholarly anarchy regarding the true message of the Pali Canon. If you reject rebirth, or claim that it was not taught by the Buddha, then you are in fact rejecting a core part of the original teachings - and you're free to do that, but please do acknowledge it. How do we know the Buddha as a historical person even existed? What physical evidence do we have? So what the Buddha really taught is speculation. What do you mean by "physical evidence?" Are you making the Francis Crick/Patricia Churchland physicalist-elimative reductionism claim? We don't know if the Buddha existed historically. I believe he did and think I can defend that belief well, but I don't know it for a fact. This is a slippery slope to the solipsism and philosophical scepticism (which I'm opposed to as a zeteticist and on other grounds) of Plato's Allegory of the Cave and Descartes Meditations where he asked himself how he could be sure if he was not just dreaming or not. More recently, it has been called the Brain In A Vat Problem and provides the philosophical premises for movies like The Matrix Trilogy and Inception. So, how does Alex know he's not just dreaming all this? How does Alex know he's not just a brain in a vat or a body in an incubator to provide energy for The Machines (this also relates to the artificial intelligence)? And we don't know what the Buddha actually said or have absolute certainty about which languages he spoke and whether or not the suttas are a clear and distinct reperesenation of his life and teachings. But it's what we have to go on and the reason why must investigate for ourselves and perpetually test for oursleves. It is why at least confidence in things like the Buddha's law of karma is necessary to help us to do so. However, to say, "What the Buddha taught is speculation" is to reason in a circle. If it's all just a matter of speculation, then we can't even, as your sentence implies, contrast his teachings to speculations about his teachings, can we? To DL and LY, when you guys use the word rebirth what do you mean? Do you mean literal something unknown and personal is passed from container to container like some kind of liquid? Or do you mean more like a bag of marbles dropped and bursting and its force spreading in all directions? The concept that the impersonal stream of experience does not begin at birth or end at death, but continues in a cycle of arising and ceasing across multiple lifetimes as propelled by ignorance. danieLion wrote: So my purpose was and is to engage in a free exchange of ideas (here, I'm influenced by J.S. MIll and Paul Feyerabend) about these important issues. I don't know if originalism is "in error" and that's why I avoided the term. I am, however, perplexed by how anyone could make such a strong claim without being there themselves (a question still not answered to my satisfaction and looking like it probably won't be). LonesomeYogurt wrote: I guess I would argue that while we can't know what the Buddha's original teachings were in a concerete, verificationist sense, it is absolutely reasonable to say that the assumption of their general accuracy is the best model that fits the data, i.e. assuming the teachings attributed throughout time to a historical figure referred to as the Buddha are in fact related in a "strong" sense to his actual teachings is the best way to make sense of the data we have. The other assumptions we could possibly make - that the suttas as we have them represent a massive, intentional case of fraud, that through sloppy recording or transmission they have become meaningless, or that they refer back to a figure that did not actually exist, rendering them almost a simulacra in themselves - are not nearly as reasonable or pragmatically useful models by which to relate to the suttas. Well put. Thanks. I cannot improve upon this. danieLion wrote: I never said I believe in "the authority of the suttas," either, nor did I mention them in terms of "history." When I study the suttas, I do investigate (again, guided by my verificationist faith in the Buddha) and explore and bring historical scholarship into to it as much as possible to aid me. As an ultimate authority, the suttas are not reliable, as historical-critical methods (a la Analayo et al) have highlighted. I do hope and desire, however, to find a corpus of suttas that best reflect the message of the Buddha as close to his "original" teachings as possible. But even the term "original" in this sense can be misleading because the Buddha changed his mind on occasion, tailored his teachings to individuals and contexts, and, along with other arahants, admitted to making mistakes. So if by "original" we mean something static, I cannot accept that, for the Buddha was a dyanamic thinker and teacher, as were many of his disciples. The complexity of investigating in this way is further deepened by the facts of textual corruptions, inconsistencies, and a schismatic climate all ready evident in the parisa and sangha during the Buddha's times. In fact, I suspect that the self-refuge passages are an indication of the Buddha's own exasperation with attempts of those around him to pin him down or twist his message to suit their own biases. LonesomeYogurt wrote: I absolutely agree. Any attempts to render the suttas infallible or even "accurate" is silly; Paññobhāsa Bhikkhu, for example, estimates that roughly 10% of the suttas refer to direct statements made by the Buddha himself. But there is a huge difference between seeing the Canon as a collection of historical records referring to a real but often-changing teaching, while applying various methodologies in order to determine what constitutes the most accurate heartwood, and tossing the whole thing out and declaring a kind of epistemological anarchism (in the "eel-wriggling" sense, not Feyerabend's) or hand-wringing indecision. I am not implying that you are doing this, be clear; I am just stating that the two extremes - slavish obedience to an imperfect collection of scriptures and skepticism that renders all possible truths about the Buddha as completely, irreparably hidden behind a vale of time - are both not only detrimental to practice but also unjustified from a scholarly position. Again, well said. I too am trying avoid extremes (see my reply to Alex123, above). Last edited by danieLion on Sun Mar 10, 2013 3:32 am, edited 1 time in total. Last edited by danieLion on Sun Mar 10, 2013 3:33 am, edited 1 time in total. What i have never understood about this is whose experience? The idea of experience presupposes a perceiver. Additionally, where does the experience end and begin? Does my "impersonal stream of experience" include my mother and father? my culture? my entire universe? And in the last case are "we" all experiencing the same universe or do we each get individual copies? Where are the boundaries between my "impersonal stream of experience" and anyone elses? And how can you know those boundaries if they exist, survive the death of the physical body? danieLion wrote: What do you mean by "physical evidence?" Remains of bones that can be dated to approximately 5th BC India and being of the Buddha. danieLion wrote: I believe he did and think I can defend that belief well, but I don't know it for a fact. danieLion wrote: So, how does Alex know he's not just dreaming all this? How does Alex know he's not just a brain in a vat or a body in an incubator to provide energy for The Machines (this also relates to the artificial intelligence)? Ultimately we cannot be absolutely sure about anything. However the evidence tilts probability into a certain favor that the world obeys certain physical laws and is being studied relatively well by science. danieLion wrote: And we don't know what the Buddha actually said or have absolute certainty about which languages he spoke and whether or not the suttas are a clear and distinct reperesenation of his life and teachings. Right. Ultimately one has to think for oneself and use suttas as a guide rather than infallible authority. danieLion wrote: However, to say, "What the Buddha taught is speculation" is to reason in a circle. If it's all just a matter of speculation, then we can't even, as your sentence implies, contrast his teachings to speculations about his teachings, can we? Ultimately we do not know what He has said. He left no voice recordings nor books. We aren't even sure of his name, nothing to say about dialects that He spoke, or what He spoke. IMHO. danieLion wrote: Pascal's wager is not concerned with the here and now but future afterlife and the safest assumptions to have about it. Of course, going with the safest assumption can drastically change one's behaviors here and now, but the wager primarly adresses uncertainties about the unseen/unkown "spritual" realms and one's possible future existence. Pascal's wager is deeply flawed. It doesn't address the issue of MULTIPLE religious beliefs. How do we know if we should worship God, Allah, Zeus, or some other God? A clever Christian can say that "God planted fossils into the earth and sets up evidence against his own existence to test our faith." A christian can say that "who cares if you achieve Awakening in this life, before death, if after death you will suffer eternally". I made a program long ago to calculate mathematical expectancy of belief using Pascal's Wager sort of thing, and if there are more than one God, there is no way out. -It is not mandatory to know whether Buddha exist or not, to attain Nirvana. - It is not necessary to know whether Einstein wrote e =mc2 to split the atom. - What Buddha taught is not speculation. You can experience, very brief taste of Nirvana, if you practice very little amount of non-anger and non-attachment. LonesomeYogurt wrote: The concept that the impersonal stream of experience does not begin at birth or end at death, but continues in a cycle of arising and ceasing across multiple lifetimes as propelled by ignorance. 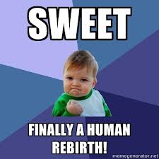 What attracts me, personally, to the concept of rebirth is that it is an attempt to explain why I was born as the person I am as opposed to being born anyone else. I can see no other attempt at explaining the origin of my particular existence. We must assume that the quality which makes our stream of experience separate and unique was conditioned in some way. The traditional assumption is that who we were born as was a result of chance-- but when I look at nature, I do not see purely random events, I see conditions influencing other conditions causally, and it is intuitive to apply such causality to the particularity of my embodiment. m0rl0ck wrote: What i have never understood about this is whose experience? The idea of experience presupposes a perceiver. I disagree. What we call experience is consciousness interacting with the other mental formations of perception, feeling, and thought - and this is an impersonal process in which experience arises but no experiencer exists. 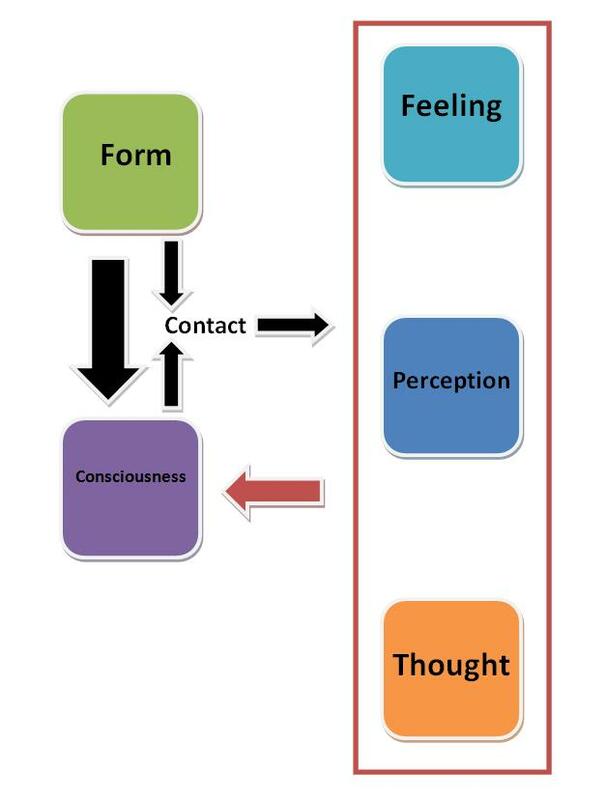 Consciousness arises dependent on form, at which point the other mental factors arise; they, in turn, condition consciousness. It's a completely natural, cause and effect cycle that doesn't require a "doer" or a "knower" in the center. Additionally, where does the experience end and begin? Does my "impersonal stream of experience" include my mother and father? my culture? my entire universe? Their experience comes through their eyes, ears, tongue, skin, nose, and mind, and thus is not known by your consciousness. Imagine if you had a thousand algae plates out for an experiment; if one plate developed a colony of bacteria, could it feed off the nutrients of the other, separate plates? No, because the bacteria arises based on the interaction of specific conditions unique to each individual sample. And in the last case are "we" all experiencing the same universe or do we each get individual copies? We each experience our individual sensory data, which in all probability is coming from observation of the same universe. Where are the boundaries between my "impersonal stream of experience" and anyone elses? And how can you know those boundaries if they exist, survive the death of the physical body? The boundaries are formed by the gulf between consciousnesses. When form hits the selfless, empty eye we refer to as 'mine,' consciousness of that form arises in the selfless, empty mind connected to that eye. The data that comes through the sense doors of my mother or father, for example, is off limits to me because those sense doors are linked to a specific mind that inhabits them (or, in our modern scientific models, a specific brain). Experience is a totally nature process, and like all natural processes, it is limited in time and space. You're right - there is, in reality, no such thing as "my former life," as this life isn't even mine! Buddhadasa's talk on anatta and rebirth deals with this. Maaan what page is that found on? I couldn't for the life of me track it down. Their experience comes through their eyes, ears, tongue, skin, nose, and mind, and thus is not known by your consciousness. It 'comes through' their eyes? So experience is actually present outside their body, and then leaps in through their eyes? What I think you mean by this is that their experience is private. You shouldn't even mention sense organs: people with Charles-Bonnet syndrome 'see' hallucinations while being blind. Sight is not always dependent on the eye. m0rl0ck wrote: Where are the boundaries between my "impersonal stream of experience" and anyone elses? And how can you know those boundaries if they exist, survive the death of the physical body? The boundaries are formed by the gulf between consciousnesses. Consciousness (which I define as the ability for a thing to have experience, or to be 'like' something) is not necessarily reducible to physics. So far, we haven't been able to identify what makes one thing conscious and another thing not conscious. (I don't believe a robot will ever be equally conscious to a human, even though it may be able to imitate the behaviour of a human precisely.) If consciousness is not reducible to physical laws, it is improper to assume that it is physical space which places bounds upon it. Buddhadasa doesn't really address the question.. he dismisses it entirely by saying the self does not exist, which is a cop-out, more a trick of language than anything substantial. The real question is why we are born as a particular individual as opposed to any other individual. Even if the 'self' is a delusion, we still have to explain the conditions which formed that delusion. Last edited by Viscid on Thu Mar 07, 2013 12:25 am, edited 1 time in total.